My wife and I are both big into fundraising. Our daughter, Samantha, has cystic fibrosis. You can read all about the disease by going to our other blog, Making Strides. Because our daughter has this disease, we contribute to the Cystic Fibrosis Foundation (CFF) by raising money for better treatments and, we pray, someday a cure. However, even though I use this information for tracking donors for our fundraising activities, what I will be sharing with you today can be used for schools, churches, short-term-mission-trips, and the like. Once you have the basics down, this is a piece of cake! During our first year as the co-leaders of Team Sam, Alicia and I tracked donations and donors using Microsoft Excel. There's nothing wrong with Excel. I still use it on the ship and Alicia still uses it at home, especially the 2007 version. The problem comes along when a person doesn't have Microsoft Excel. Then what? Not everyone wants to pay the $150 for the office suite. That's when you can turn to OpenOffice! I know that there are weaknesses to every software, as well as strengths, and Microsoft Excel is one of the few programs that seem to have very few weaknesses, which is why I value it. However, when my Microsoft Office crashed on deployment, I was left without an option. This forced me to use OpenOffice Spreadsheet, which I had downloaded from Sun Microsystems before deployment. I've never looked back. I can do anything I want to with this spreadsheet, including tracking my donors and running the same figures I run on Excel. While not all graphics are available in the same format that they are in Excel, I doubt the average user would notice. So why this discussion? A new copy of Microsoft Office Excel would have cost me close to $100. Since I would have needed Word and Power Point as well, it would have cost $150. Instead, I got Open Office's entire suite for a $15 donation, and that's because I wanted to give something, not because I had to. Sun Microsystems, the publisher of OpenOffice, requests that users contribute not by sending money, but by helping make the program better. Since I don't have that much knowledge on writing programs, I opted to send a few dollars. Not only have I got my money's worth from the program, but it's made me a believer. Whether you are a church administrator trying to eek out a little more productivity on older computers, or a CFF fundraiser hoping not to spend money on programs so that you can use that money for other things (or simply save it), OpenOffice will make you a believer too. 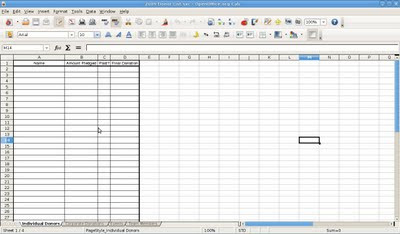 Open the picture I have above this post and see for yourself how much it looks like Excel. You can also see my headings and how I tracked my small donor base. If you're using a Windows computer, all you have to do is go to OO's website and download the program. It installs like any other program through Windows. Then you open it up and use it just like you would Microsoft Office! You can save your documents or spreadsheets in Microsoft formats as well, which will be completely compatible with your work computer or your boss's computer. Best of all...it just works! It is available for windows, Mac, and Linux. As usual, you offer great advice and timely comments! Thank you so much. I'm going to look into this and review it. This is amazing. thanks for sharing a tip! Thanks for visiting! I hope things are ok over in your corner of the globe! Please update us all soon! And let me know how this software works out for you when you have time to try it out!